2016 had a near-record number of new printings seeing play in Vintage, from Thought-Knot Seer to Paradoxical Outcome. Whether you want to organize your collection better, or track down cards you may want to use in Vintage tournaments, this article and accompanying spreadsheet is the perfect tool. In addition to providing a complete list of Vintage playables by color, this article also identifies all of the new cards that saw play in 2016 (new printings and otherwise), as well as cards that disappeared from Vintage tournaments. 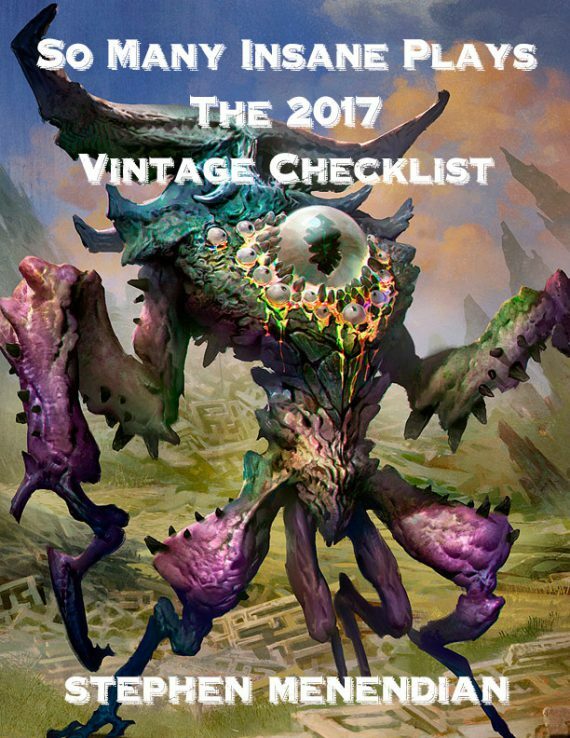 This is a great resource for new and old Vintage players (and collectors) alike. Please note this download is in ZIP format, and includes both the full PDF article (outlining the methodology for selection, as well as the complete list of cards), coupled with a handy multi-tab Excel spreadsheet that you can further use to manipulate cards and quantities. Once you have downloaded the file you will need to unzip it to access the documents. 7Zip (multiplatform), Peazip (multiplatform), izip (Mac), and Unarchiver (Mac) are just a handful of the free unzip tools available if you don’t already have one handy on your computer.